Want the beauty of a fireplace without the heat and mess of burning wood? A gas log set gives you full, flickering fire in your existing wood-burning fireplace at the touch of a wall switch or remote control button. More convenient- You'll never have to mess with cutting or hauling your own logs each year. There are no ashes to bag, no chimney or fireplace to clean. Starting and stopping the fire is as easy as pushing a button. Safer- Gas logs give you all the ambiance of a wood-burning fireplace without the the dangers that come with burning wood. For example: Wood-burning fireplaces create creosote, a sticky, oily, combustible substance in the chimney, so you always have the danger of a chimney fire. Also, you can build too large of a fire and overheat the chimney, endangering your family in the process. Maintenance-free- Never worry again about maintaining the fire's flames--unlike wood-burning fireplaces, which require constant attention as they are burning. Healthier for your family and the environment- Regular wood fireplaces create indoor and outdoor wood smoke pollution which has been which has been linked to cancer, asthma and other serious health conditions to cancer, asthma and other serious health conditions, according to the EPA. If you don't want the campfire look of gas logs, you can add flame resistant glass rocks into your gas fireplace instead to get a more modern look. Be amazed as the reflective bits in the glass reflect the fire so that the glass sparkles like jewels and sends little bits of light around the fireplace. Gas logs aren't for everyone because they produce very little heat and are mostly for decoration. Gas fireplace inserts- Designed to be retrofitted into your existing wood-burning fireplace, upgrading its efficiency and heat producing capabilities. Zero clearance gas fireplaces- Can be installed into a wall or framed into a mantel cabinet that can be located anywhere in your home. 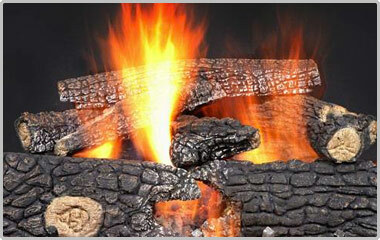 This can be installed without needing a pre-existing wood-burning fireplace. Interested in decorative gas logs and accessories for your Washington home in King, Snohomish, Skagit and Island Counties? Contact us online or call us at 1-800-888-1045.